Often, simulation is the best way to learn. That will be evident in Houston at The Methodist Hospital’s 35,000-square-foot interactive, simulation-based surgical training center that opened in January. 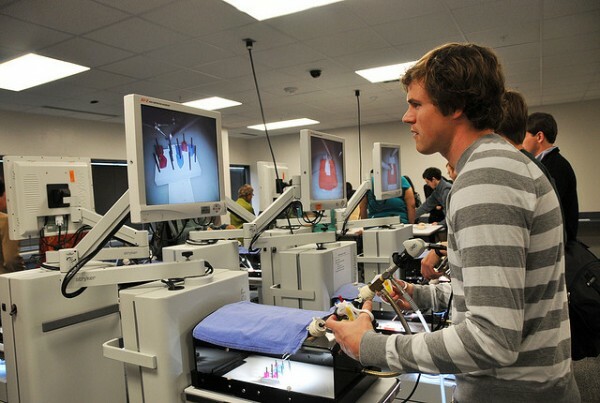 The hospital created the Methodist Institute for Technology, Innovation and Education (MITIE) to help practicing physicians acquire new high-tech skills, including image-guided therapies, surgical robotics and new techniques. The center will re-create high risk patient care environments. It has a procedural skills lab for hands-on training with state-of-the-art models and a suite of 15 operating rooms for image-guided procedure research, robotic surgery and technology development. “The nation lacks a place where surgeons can get measurable skills training on new technologies”, said Dr. Barbara Bass, executive director of MITIE and chair of the department of surgery at Methodist. They can train on procedures in a simulated operating room, see how imaging combines with surgery for less-invasive procedures, use surgical robots and human patient simulators and perform cardiac and vascular procedures on a computer simulator. As part of an investigational study, trainers can measure stress with a thermal camera to determine a trainee’s surgical expertise. Teams in training can view surgeries being performed in multiple operating rooms, all while accessing educational materials about the surgeries. They can ask questions and manipulate cameras to get customized views of the procedures.